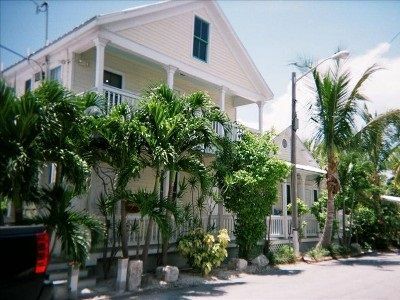 Looking for the perfect AFFORDABLE hide-away in Key West? Located in a remodeled Victorian Home - this guest room is just perfect for two! This guest room is cozy (the size of a small hotel room, 10'X12.5' plus bathroom) with a QUEEN size bed but is so much better than a hotel room. We provide high quality cotton sheets and thick, luxurious towels. We offer a studio kitchen with apartment sized fridge, microwave, toaster oven, coffee maker, two burner cook top, blender, and everything you'll need to cook and serve a romantic meal. It is nice to be able to make a sandwich or picnic to take to the beach! There is a wonderful table just out the back door if you would like to eat under the palm trees. No need really - just two and a half blocks up is Duval Street where hundreds of bars & restaurants await your fun times. The beach is a five minute walk and there you can enjoy the gorgeous warm turquoise water ALL YEAR ROUND. Just relax on the pristine white sand under the tall swaying palms. When you get too hot - simply stroll back to your air conditioned hide-away. The bed faces an armoire and 32' flat screen TV. The gorgeous Victorian Home which is now divided into individually owned rooms - is an architectural masterpiece... but unlike many bed and breakfasts, walls are thick and your privacy is insured. The neighborhood is a wonderful mix of guest houses, full time local folks, and visitors. While you are walking the streets - stop and chat a spell with anybody who is rocking on their front porch. You might meet some real Key West characters! Our location is so close to Duval (a five minute walk) - it will be a great place to gather with friends to head "downtown". OUTSIDE There is a wonderful back deck with lovely shaded eating area, another picnic table under the huge Banyan tree, and lots of lounge chairs to lay in the sun. These are all within the fenced yard of the property. It really is amazing to find this quiet seclusion right off of the excitement of Duval Street! You will find coupons and local discounts to many attractions, restaurants and bars. What type of coupons? Discounts on drinks, discounts and specials on water sports including sunset sails, discounts on glass bottom boat rides, 50% off a local Scavenger Hunt and free passes to a cabaret drag show. The coupons and vouchers will vary but I put together a packet of fun coupons so that you can come down and enjoy yourself instead of spending part of your vacation looking for discounts! We want to provide an affordable solution to the high prices of Key West Hotels - and we think this is it! If you are looking for a full service hotel this is not for you. My studio is best for folks that want to see Key West, not stay in their room during their vacation. While it is quite small, it is one of the best values in Key West. We don't pretend to be a full resort, we are a great option for those that are looking for value and a clean well-appointed room! WE GUARANTEE YOUR UNIT WILL BE SPARKLING CLEAN UPON YOUR ARRIVAL. So come on down to the Southernmost City and have some fun! Two bikes are provided for your use at no extra charge. They are right on property with the number 6 (our studio number) on each bike. You will be able to ride to beaches, parks, botanical gardens and of course, bars, restaurants and sunsets!! And you will enjoy our 'Favorites' book which has all of the menus of our favorite restaurants, ideas for day trips, the best attractions and some coupons you will love. We live here and if you have ANY questions - PLEASE call and ask...we know ALL of the LOCAL HOTSPOTS. Your can rent nightly or weekly!!! Rates range from $99 to $149 per night, holiday and special event rates may be higher. Your Rental Will Include The Use of Two Bikes For Free!!! Security Deposit/$200.00 FULLY Refunded when no damage to the Studio or bikes. One Time Cleaning Fee - $60 on all stays regardless of length of stay. Fantasy Fest rates for 2017 - $1750 for the entire week. AC unit in studio controlled by guest. Kitchenette, no oven available but toaster oven is provided. Very small table in room with two chairs and plenty of room outside on the back deck. Our Key West stay at Galleria Studio 6 was wonderful. The ideal location makes it so easy to visit everything. Having bikes readily available was a huge plus and Ken’s suggestions for restaurants and places to visit were spot on. We couldn’t have asked for a better experience as first time visitors to beautiful Key West. We are definitely planning a return visit! Thanks for a wonderful experience! Great value, clean and pleasant accommodations. Close to Duval in a quiet neighborhood. Would certainly stay again! The reviews and descriptions accurately portrayed the rental. It was comfortable convenient and we really enjoyed our stay. We did not have a want for anything since the room is well appointed with the necessities. There were some renovations underway but it didn’t interfere with using the property or having a great time. Ken is definitely a great host and very accommodating. Excellent value and very clean room. Our first time in Key West and we had a great place to stay. The room was small but clean, which we knew about, but everything we needed was there. It is located very close to all the must see places; Duval street, butterfly house, most southern point and Zachary Taylor state park. The best thing about the house was the 2 free bikes that were included. We just parked our vehicle and rode the bikes everywhere, which really saved on parking fees. The only issue we found was parking close to the room was challenging, but that is an issue everywhere in Key West. We had a great time. Ken's suite was a perfect spot to stay. Close to all things Key West, but far enough away from the action to be restful. He took care of our every request. Thanks again. The studio is 2.5 Blocks from Duval Street, the main street in town.